The clock in our tower dates from 1841 and was supplied by Ebenezer Fisher who, with his wife Margaret, had a watch and clock-making business in Cross Street, Ellesmere between 1839 and 1846. It is the only known church clock that that bears his name and, for a long time, it was thought he acted merely as a dealer of a product of some other maker. plate has the legend ‘J. Rogers, F.W. Smith, Churchwardens’. However, in the course of the recent restoration, Fisher’s name has been found engraved on several other components, leading to the view that he did indeed make it himself. It was constructed as an eight day, two-train type and is housed in a ‘chair’ style of frame. The ‘going’ train (that drives the hands) is regulated by an anchor escapement mechanism. Alongside this is the hour striking train that uses the tenor bell in the belfry above. Prior to the recent restoration it was driven by two weights of approximately 112lb (50kg) and 165lb (75kg) which had to be wound by hand each week. They hung on steel wires that passed over pulleys in the clock chamber ceiling and fell inside a shaft down to ground level, a distance of over 32 feet (nearly 10 metres). The wooden pendulum is 7’ 4½” (2.25m) long with a large metal ‘bob’ at the bottom. About half way down is a small tray with a peg to take a number of washers for finely regulating the accuracy. Adding or removing a washer adjusts the clock by about 1 minute per week, something that is needed throughout the seasons in response to changes in weather conditions. 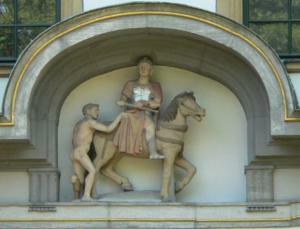 For much of its life the clock would have been the only timepiece available to local residents. Correct time would be maintained by comparison with a brass sundial made by Thomas Hampson of Wrexham in 1729. This disappeared several years ago, though its stone plinth can still be seen in the southern part of the churchyard. hands and minute marks re-gilded by J.B. Joyce & Co of Whitchurch. In 2008 the movement itself began to cause problems. The striking train became unreliable and was disengaged, to be followed in the following year by the going train. 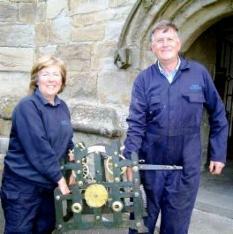 Michael Appleby, the Clocks Adviser to the Diocese of Lichfield was asked to come and take a look. He inspected the movement, pronounced that most of the brass bearings were worn out and that a complete overhaul was needed – believed to be the first in its 169 year history. 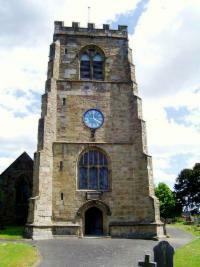 The Parochial Church Council (PCC) agreed to the suggestion that contractors should be invited to tender for the overhaul and also to convert the movement to automatic electric winding. English Clockmakers of Tissington, near Ashbourne in Derbyshire was awarded the contract and completed the work between April and June 2010. The clock is still driven by weights and so will keep going during power cuts. Electric motors now raise these weights to their highest point several times a day. The shaft that previously extended down to ground level is no longer required and has been removed by members of the church. This left holes in the clock and ringing room floors that have been made good and a new carpet has been fitted in the ringing room. Whilst the clock scheme was underway, work continued on an earlier project to remove surface rust from the steel bell frame and repaint it. We think we now have the best kept church tower for many a mile! Prior to 1959 the tower had three bells which, according to H.B. 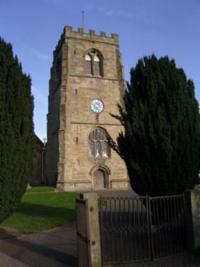 Walter’s ‘The Church Bells of Shropshire’ published in 1915, were “in a shocking condition and the treble cracked”. In 1959 John Taylor of Loughborough (one of only two bell-founders now remaining in the UK) re-cast the old treble and added three lighter bells to make a ring of six. These were hung for change ringing in a new metal frame capable of taking eight. The tenor was described as ‘a particularly fine bell bearing an oak leaf border between the words’ by the bell historian Ranald Clouston in 1988. It measures 353/8” (905mm) in diameter at the lip, weighs 7cwt 2qtr 22lbs (391kg) and strikes the note A. The two 1634 bells are of sufficient historical interest to have been listed for preservation. The church wishes to publicly record its thanks to all these individuals and organisations for their support for the schemes. 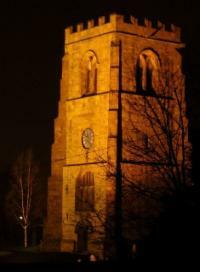 For much of its life, the church clock would have been the only timepiece available to local residents. Whilst such dependence on its function is now merely history, the existence of the clock and it’s regular striking of the hours is a familiar and comforting presence for many. About three years ago, BBC Radio 4’s ‘Today’ programme ran a feature on what sounds define Englishness; church bells were the listeners’ choice. The regular striking of the clock and the ringing of the bells for Sunday services, weddings and occasions of National significance are well-loved fixtures in our aural landscape. The bellringers are always looking to increase their numbers. If you’re intrigued by what you’ve seen and heard this afternoon, why not come along to a Monday evening practice and find out more? Contact our Tower Captain, Alex Olah, on 772874.